Gov. 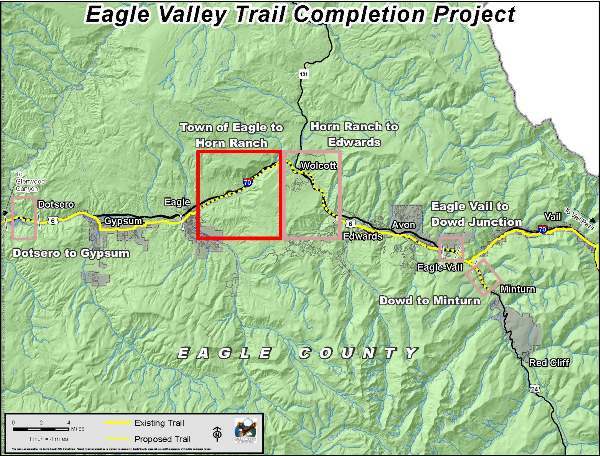 John Hickenlooper’s new 16 in 2016 initiative, first announced last week during his state of the state address to kick off the 2016 Colorado legislative session, includes a 7-mile section of recreation trail northeast of Eagle that will go a long way toward completing the 63-mile Eagle Valley Trail. When complete, the Eagle Valley Trail will be a 63-mile, paved trail that travels the length of the Eagle River Valley from Dotsero to the Town of Minturn. The trail will connect to the Gore Valley Trail through Vail and the Vail Pass bike path. Approximately 37 miles of the trail are complete and in use today. The next priority segment is seven miles from the Town of Eagle to the 287-acre Horn Ranch Open Space Park – connecting users to recreational opportunities in the park as well as other nearby public lands. DENVER — Wednesday, Jan. 20, 2016 — Gov. John Hickenlooper today announced the state’s highest priority trail projects as part of Colorado the Beautiful’s “16 in 2016” initiative highlighted in his State of the State address last week. The projects represent the state’s 16 most important trail gaps, missing trail segments and unbuilt trails, and reach from the Front Range to southwestern Colorado. Identification of these 16 trails is designed to build upon strong existing support and partnerships to push them to completion. The “16 in 2016” initiative was created to start a more focused, coordinated conversation to support trails and promote outdoor recreation across Colorado. Moving these projects forward means a better connected network of trails statewide, improved links to expanded outdoor recreational opportunities, safe alternative transportation routes and economic development opportunities for adjacent communities. The initiative is a key component of Colorado the Beautiful’s broader goal to ensure, within a generation, every Coloradan will live within 10 minutes of a park, trail or vibrant green space. Projects were selected based on several criteria, including their economic development potential, their proximity to underserved communities, the need for new paved and natural surface multi-use trails, the potential for greater partnerships across all levels of government, nonprofits and the private sector, and the project’s ability to support environmental stewardship. Most of the selected projects have been under development for years and already benefit from local support and partnerships. Some trail projects are larger and will need significant additional investment; others are more localized and need a push to get over the finish line. The “16 in 2016” initiative is intended to focus attention and resources on those projects. In order to support the advancement of these 16 priority projects, Hickenlooper will create an inter-agency council comprised of relevant state agencies and offices. This Council will ensure appropriate coordination occurs across state government to promote trail projects and outdoor recreation, and work closely with the newly formed Office of Outdoor Recreation Industry and the Colorado Pedals Project. The initiative is only the first step in a public process to develop a statewide plan for trails. Colorado Parks and Wildlife (CPW) is undertaking a strategic planning effort for their Trails Program that will set values and goals for expanding and maintaining recreational trails across Colorado. Additionally, CPW will publish a statewide trail map this spring, making it easier for Coloradans to plan and experience an outdoor recreational activity. While no new state dollars are tied to these projects, Great Outdoors Colorado (GOCO) is investing $30 million in trails over the next four years as part of its Connect Initiative that will improve walkable and bikeable paths and trails for projects across the state. This special initiative is part of GOCO’s new five-year strategic plan to protect land for people and wildlife, connect people to trails and other outdoor opportunities, and inspire kids to get outside more often. GOCO has dedicated the first $10 million of funding for Connect in 2016; these 16 priority projects, along with other qualifying projects, are eligible to apply for funding. Additional trails funding is available to eligible entities through other competitive sources, including Colorado Parks and Wildlife, the Department of Local Affairs and Colorado Department of Transportation. A list of the 16 trail projects identified in the “16 in 2016” initiative is available on the Colorado the Beautiful page of the Colorado Department of Natural Resources website. The list includes a brief summary of each proposal and a map locating each project.